So as promised (on Facebook a couple weeks ago), below is the yellow cupcake/cake recipe we’ve been using. And while this recipe below (originally from Joy of Cooking) contains sugar and some white flour – both against our real food rules – I recognize this is WAY better than the store bought boxed version that many have relied on for years and that unfortunately contains a lot of unwanted additives (like hydrogenated oils)! And for the homemade frosting I even used all natural beet juice for the pretty pink color you see in the photos. For a less girly look feel free to experiment with small amounts of other colored juices as well (I froze the leftover juice in an ice cube tray since it didn’t take much). 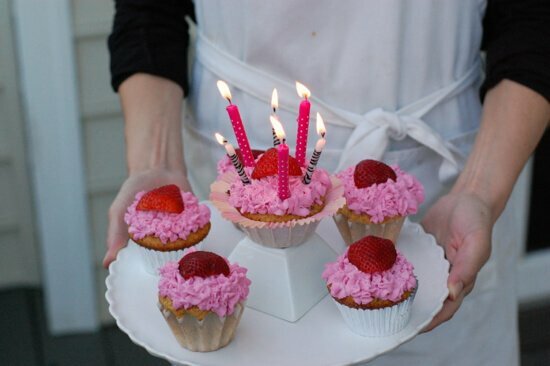 So for those occasions which are truly special – like birthdays! – we hope you enjoy this homemade treat with your loved ones. Click here for two frosting recipes to choose from...yes, just pick one! Line a cupcake pan with 20 paper liners and set aside. Preheat the oven to 350 degrees F.
In a medium sized bowl whisk together the flours, baking powder, and salt. In a separate bowl combine the milk, egg yolks, and vanilla. In a large mixing bowl use an electric whisk to beat the butter and 1 1/4 cups sugar together until creamy. Stop and scrape the sides of the bowl. Turn the mixer down to low and slowly add both the flour mixture and milk mixture in small batches (and alternating) while the mixer is still going. Scrape the sides of the bowl as needed. Set aside. Again using an electric mixer whip the egg whites along with 1 tablespoon sugar until they are light and fluffy and peaks begin to form. Do not overmix because the mixture will become dry. Using a rubber spatula carefully fold the egg whites into the cake batter until it is combined thoroughly (again be careful not to overmix). Equally divide the batter into the 20 cupcake liners and bake until a toothpick inserted into the center comes clean, about 22 to 24 minutes. Let cool completely before adding frosting. Cupcakes can be frozen unfrosted. Click for the frosting recipes. Previous Post: « Grilled Meat and Veggie Foil Packets…Yum! what do you suggest for green frosting?? I know this is old but this cake flour is giving me a hard time! I found unbleached but it’s made in a places that processes nuts! Can’t use! Can I sub pastry flour for the cake?? Thx! We made the cupcakes and they are great but just saw on the cake flour box that it’s not but free so I can’t send to school!! My birthday is coming up in December and I am facing a dilemma. My absolute favorite birthday cake is Red Velvet Cupcakes. I love them, a lot, but my recipe calls for 4 tablespoons of red food coloring. I am assuming the kind I have been using is petroleum based. I don’t want to put that in my body, but I still want Red Velvet for my birthday cake. Could I substitute beet juice for the food dye? Any other suggestions? Thank you! This recipie calls for sugar, I assume white granulated sugar? Also could you sub with maple syrup or applesauce? 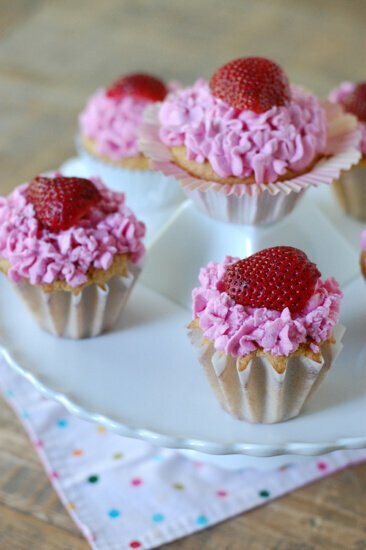 I want to make these for my daughters’ preschool Valentine’s parties but one student has a milk allergy (just milk not butter) is there something I can substitute? 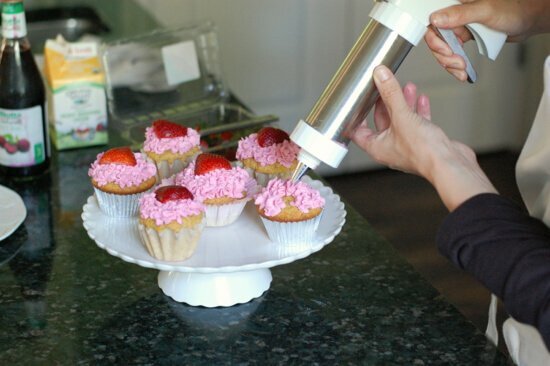 Btw I use pomegranate juice to dye my frosting instead of beet juice – much easier! Hi Erin. You can sub with almond or coconut milk. My daughter’s birthday is coming up and she has a friend that can’t have dairy. I was planning on subbing the milk with almond milk. What about the butter? Will coconut oil work? Also, any suggestions on a tried dairy free, whole food frosting? Can find some but with things I usually don’t bake with like soy margarine and I’m sure they aren’t whole food. 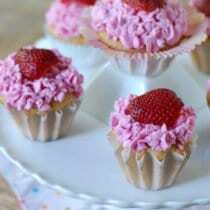 Btw, have made this as written in cupcake and cake form and it is a great recipe! Thanks for replying. That sounds like a perfect solution. Sounds safe to make the night before, throw in fridge and take out 30 minutes before serving so not too hard? What’s your experience with it overnight? Thanks again! Hey again. I’ve not made it the day before so I can’t say how well it will hold up. Could this be made into a cake and if so how would the temp/time be affected? I have always wanted to try coloring my homemade buttercream with beet juice, but was afraid the frosting would be too runny to pipe. Thanks for the recipe! My girl will be so excited to have PINK frosting on their birthday. Hi! I made these the other day and they were dry and had the texture of corn muffins and 22 minutes was way too long. I live in SC and am glad I no longer need to make altitude adjustments like I did in UT at over 6000 ft. I also normally mill my own grain to the finest grind, but I didn’t do that this time, so I will try that next time. Do you have a video that shows how to fold in the egg white fluff? I’ve always been great with baking moist muffins and sweet breads, cookies, and brownies, but I tend to shy away from yellow cake because they never turn out for me. I would greatly appreciate any help. I did try a naturally sweetened version from another source using peach puree and although I liked that it was all-natural, the texture was like a dry sponge. Thank you! Hi Rosa. This might help: https://www.youtube.com/watch?v=0Yie5V37E1w. I would like to adapt this recipe to fit a standard sheet cake pan. I tried once and remember that the cake turned out very dry. I may have overcooked since the middle was not set after the recommended baking time. Do you have any suggestions? Do you have to use cake flour or would just all white whole wheat flour work? Hi Ann. No, Lisa did not have luck using all whole wheat flour.